In my oppinion, these new tools for analysing and troubleshooting batch jobs are the most important enhancement we got, talking in day-by-day situations. For us, developers and JDE technicians, to have a tool that can provide dynamic logging or statistics in execution time on server is a big advance. Below a sample screen shots with these features. You may click the picture to zooming in. This is the default screen when we got the Work Submitted Jobs screen, with the difference that we have the options: "Debug Logging Status" and "Introspection Status" as you can see in the picture below. 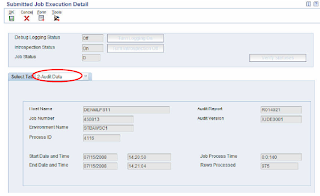 Audit data displays details about how a batch job was submitted and how it completed. Audit information is captured for all UBE's. This powerful tool allow us to monitor in execution time any Job to get for example the current event, current code line number, last BSFN called. This will improve the tracking for problems, we can now check in real time the execution of a job running on server. I think this breaks a big paradigm in JDE and will allow us to have a more precise diagnostics of the batch flow in case of problem. Turn the Introspection "ON" while the UBE is running, displays current statistics. 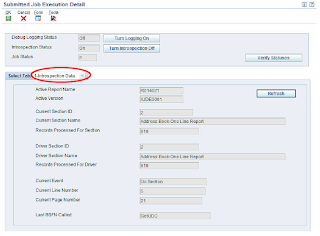 Refresh button reload statistics and "Turn Logging On" to generate debug logs, if logging not turned on when UBE was submitted. Let me know if you want more information about this feature! In this weekend I'll prepare a post in how to install the OC4J web server in the JDE Demo 9.0. Hi, Can I get more information on this tool.